In March of 1967, James Robert Ringrose was arrested by Japanese police in Osaka, Japan while attempting to pass bad checks. It turns out he happened to be on the FBI’s “10 most wanted fugitives” list, and when extradited to Hawaii he told the waiting FBI agents that he had been saving something for them for several years and that now he needed it. 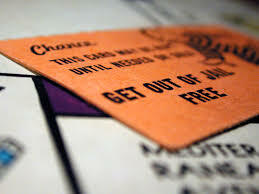 He reached into his pocket and presented them with a “Get Out of Jail Free” card from the Monopoly game. Pilots have their version of the “get out of jail free” card as well. It’s called an Aviation Safety Reporting System (ASRS) report, and it allows pilots to reveal their own violations before they get caught and sent off to jail. The reports go to the folks at NASA, where the information is collected, and then, while keeping the identity of the pilots confidential, sent along to the FAA in order to point out the potential dangers in the system. As long as the violation wasn’t intentional, if the FAA comes after you and you reach into your pocket, Ringrose-style, and show them the receipt for making the report, the FAA will not be permitted to prosecute you. The program was created in 1975 after an airline accident involving a misunderstanding of procedures known to pilots but kept hidden from the FAA. It was a rather elegant solution to the age-old problem instantiated by what happened when I was four years old and lit a book of matches in my closet right underneath the highly flammable plastic dry cleaning cover. My father found the matches, lined up his three kids, and “inquired” as to whom among us was the guilty party. Even though my father eventually resorted to saying he wouldn’t punish the one who fessed up, that just wasn’t a big enough guarantee, so, sad to say, he went to his deathbed almost 90 years later never knowing that it was I who lit the matches. I might have fessed up if I really understood and trusted that my dad would forgive, although I doubt it. The shame of having endangered the family and the guilt for having done something wrong undoubtedly would have defeated the courage needed to confess. Yet I still can’t help being impressed with the deep power of forgiveness. The Old Testament context in which I was raised sadly doesn’t emphasize interpersonal forgiveness, but the New Testament, via Jesus’ injunction to forgive “seventy times seven times”—presumably because there were no calculators in those days, is rather pivotal throughout. This is especially true, Luke tells us, if there is repentance involved, which can, I suppose, come in the form of a genuinely offered ASRS report. I don’t know, but I doubt that the governing forces involved in creating aviation’s “get out of jail free” card were motivated by Christian virtues when they decided that this would be a good idea. They must have realized, though, that in order to improve safety it was important to gather as much data as they could in order to best understand just what could be done to improve the system. Danger lies in the hollows of deception, and deception arises in an environment of fear, guilt and shame. Some will say that there is no such thing as a get out of jail free card in real life; karma will rear itself sooner or later. But if there were one, I imagine it would function much like an ASRS report, as only an invitation to the healing by shedding some light. It would be nice if, Ringrose-style—I could offer up a get out of jail free card to others I have hurt or wronged. In doing so, I don’t imagine I will get out of jail free, but perhaps if offered with genuine repentance and a true commitment to doing better, in some small way I can contribute to making the skies a safer place in which to fly. This entry was posted in Aviation by iraheilveil. Bookmark the permalink.